We’re having fun guessing where Andrew Bird’s sock monkey ran off to, because there was no monkey in front of the Janus horn tonight, either. Current frontrunner theories: a holiday in Mallorca, getting another bespoke monkey suit made, off seeing Rise of the Planet of the Apes. But I think I can manage to put down the monkey theories for a while, because there’s a show review to write, and a little expansion to do on last night’s review. It’s one that’s particularly special to me, because living in Colorado has given me an understanding of the song that I wouldn’t otherwise have had. Everything you’ve ever heard about the sky out west being bigger is true — and what goes with that is being able to see the weather coming a few hours before it arrives. I’ve spent three and a half years watching storm systems spill over the Front Range and head out over the plains, watching fronts roll through southern Wyoming, figuring out that the monsoon rain is right over my apartment from twelve miles away on the completely dry interstate, zipping down the road to the Denver airport where one side of the highway looks like a Roy Rogers fantasy land (complete with bouncing tumbleweeds) and the other looks like Mordor. Living here has made me very aware of space: how much space I take up, how much others take up, how fast you can get to a place where the road is the only visible sign of human habitation from downtown Denver, and how we use the space we have — and, yes, about how long it will be before the surprise blizzard strands you at the airport overnight. (Three hours, in late March.) I can see it all from here, the weather systems of the world. What’s notable about that song is that the story unfolds from a place of stillness. The unnamed woman is speaking to the back of the unnamed man’s head, from the edge of a bed. And weather systems don’t stay still. She sits, she tells him that she can see everything, and she affirms every individual’s status as a free agent of varying degrees of power and importance. All she has to do to see all of that is watch the weather roll in and move out. 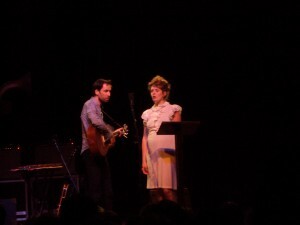 Having done exactly that many times in the last few years, I can tell you that the experience isn’t entirely unlike watching Andrew Bird perform, and the connection there is space, and how it’s used. If Bird is still, with little to no kinetic energy to him, something’s wrong. He knows how much space he has to use on the stage and he knows how important it is to not get tangled in the mics, cords, and various instruments — if he does, disaster. Watching Bird move is like watching a particularly unpredictable weather system. The only constant is that he stays in motion. And the last year and a half, at the Largo show and the gezelligheid shows, that motion has mostly been slow and sluggish. After the last two nights, it doesn’t appear that that’s the case any more. He’s terrifying in both his economy of movement — I spent a lot of time watching the bow of his violin — and in the way that all his movement appears necessary. The fierce, theatrical physicality of the show is tremendous — and it’s also what it used to be like to watch him. If he mostly took off the last year and a half to recharge, it’s worked. His performance is magnificent. Like I said last night, the material is further refined, sharper, with more harmonic elements worked into the looping — but Bird hasn’t defeated it so much as temporarily wrestled it into submission. 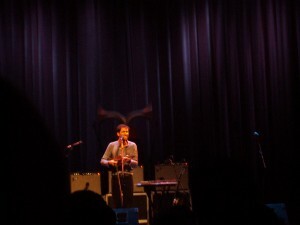 There were differences in arrangement in “Desperation Breeds” and “Danse Caribbe” between the two nights, and not all of the differences worked in Bird’s favor. On the car ride home from Boulder we were listening to live and studio recordings of the same songs, and I said, “The new material I heard tonight is a lot tighter than it’s been — but I can’t project what the band versions are going to sound like, whether live or studio, because none of it sounds complete enough for that. Can you?” Nobody in the car could. None of us are professional musicians, of course, and it’s entirely possible that Bird and company have already been working on that — especially given the Hideout Block Party next month, which is supposed to be with the band. But if the new record is as close to done as Bird made it sound both tonight and in his interview with Westword, Denver’s alt-weekly, there’s a lot of work left to do if we’re getting that album in the first quarter of 2012. All of that aside — as pleasant and cricket-filled as the Arvada Center is, tonight’s show at the Colorado Chautauqua in Boulder was miles better in terms of how well Bird used his space. The Chautauqua is more than a hundred years old, and as a venue, it’s the venerable wooden roller coaster to all the slick coasters that turn you upside down and try to kill you. It is the music barn to end all music barns. It seats 1500 and it feels smaller. The acoustics are ace and the room feels like it’s got real history. Both Andrew Bird and Haley Bonar responded well to that. Part of it was that there was an actual space to fill — no walls at the Arvada Center — but they also took visible pleasure in heading down to the PA-less mic at the front of the stage to do the Charley Patton covers and “Lusitania.” “Old-timey style,” Bird said, with satisfaction. There’s one last point I want to note in passing, because it’s a thought that isn’t full-fledged enough to do anything with quite yet. Bird seems to be tracing the Great Migration and the Middle Passage in reverse: in terms of musical influence, he starts from Chicago, works down to Mississippi, over to the Caribbean, and, with his recent collaborations with Konono N° 1 and Etran Finitawa (which he spoke about tonight), back to Africa. There’s no indication of how conscious a process this may be for Bird, but it’s a pattern, and worth keeping an eye on in the next few years. 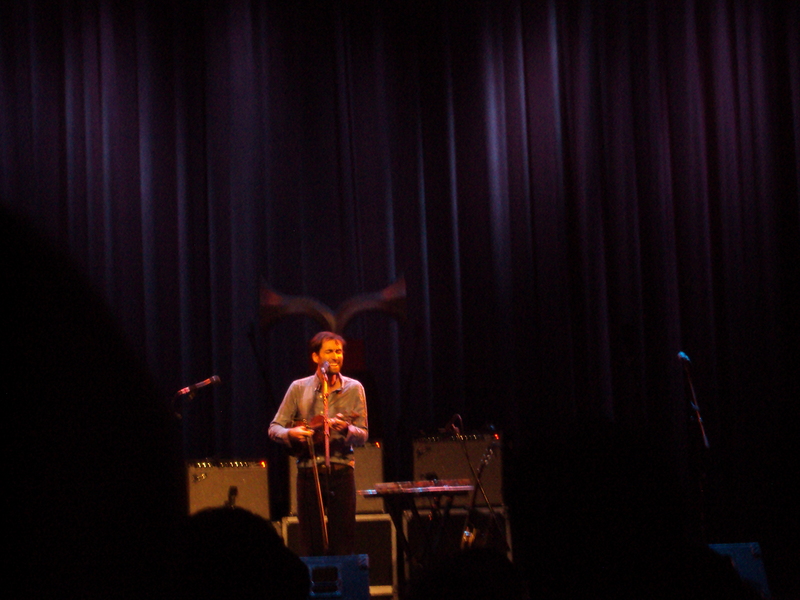 In other words, Andrew Bird is screwing around with temporality, referentiality, genre, and space again, and at least for a few hours, all was right with the world. Tomorrow is for the rest of it all. Tonight is for snacks with friends.